I was completely bowled over by the response to our first installment of this series, the Amalfi Knot, which has since turned into one of our most-read blog posts ever! I can’t thank you all enough for your support. I guess Lois Avery customers, or any scarf owner for that matter, really wants instruction on how to properly wear and tie scarves. And I’m very happy to provide that guidance! 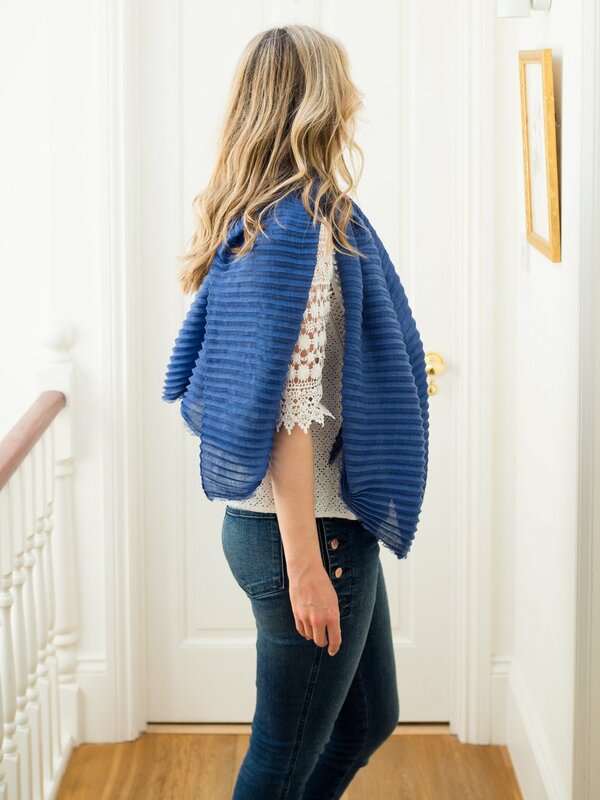 So I thought with the holiday season fast approaching and with packing summer styes weighing on everyone’s mind, it’s time to share another scarf how-to. Which brings me to the Roma Drape. A very simple concept, but trust me when I say it can transform an outfit. It simply cries out to be worn in Rome whilst riding on the back of a Vespa with the scarf flapping behind you in true Audrey Hepburn fashion. To demonstrate how to achieve this look (minus the Vespa), I’m using our Pleat Cashmere in Chambray. It’s the colour of the season, and let’s be honest, Audrey definitely would have worn this one! A quick note: Steps 1 and 2 are usually the same for all our knots. So no matter which look you’re going for, know those first two steps are going to be the same nearly every time. Give your scarf a good shake—especially if it’s been in storage. I never tie any knot without first shaking out my shawl. This is a great way for getting rid of creases, and the bonus is that shaking can dislodge any of those wretched moth eggs as well. Begin to scrunch the scarf together using your hands—almost like an accordion. Then throw the scarf around your neck. It should be even on both sides. Next, choose which shoulder you’d like to drape the scarf over. Once you’ve chosen, tie the scarf in a single knot slightly off to that side. Either side works, it's simply personal preference. Fan out the front piece of the scarf and make any necessary adjustments. Fan out the back piece of the scarf to really show off those gorgeous pleats. Voila! You have yourself a Roma Drape! Enjoy and don’t forget to add in the Vespa! Afterall, it would make a gorgeous Instagram photo!